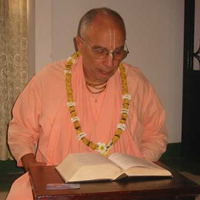 His Divine Grace Om Vishnupad Srila Bhakti Pavan Janardan Maharaj first joined the Krishna Consciousness Movement around 1970 in Europe, where he took shelter of the lotus feet of His Divine Grace Srila Bhaktivedanta Swami Prabhupad. 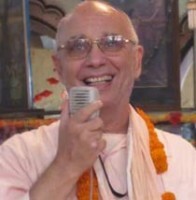 He remained there actively helping with the preaching activities until Srila Swami Maharaj asked him and many other disciples to go to India to help expand the Mission there. Seeing that this was very important service Srila Janardan Maharaj immediately went there and helped with his full energy. 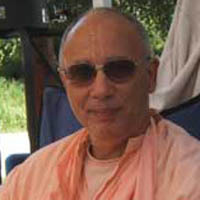 After serving in India for two years, Srila Swami Maharaj conferred the sannyas ashram on him and thus he began to lead various preaching and collecting programs throughout the length and breadth of India. 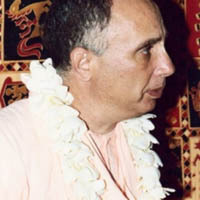 After doing all he could in that environment, he was asked by Srila Swami Maharaj to organize the program in Hong Kong, then finding that Srila Janardan Maharaj was fluent in Spanish, he was dispatched to South America where he headed many preaching programs and finally took full charge of the large Mission in Mexico. 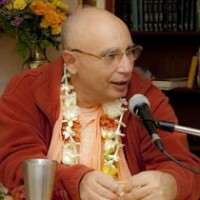 After the disappearance of Srila Swami Maharaj in 1977, Srila Janardan Maharaj continued to preach, publish and manage the mission, but in his heart, he felt something lacking. 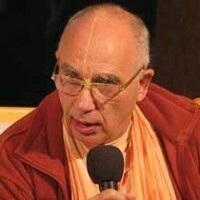 So in 1987, his internal inspiration sent him to the lotus feet of Srila Bhakti Rakshak Sridhar Dev-Goswami Maharaj, an intimate friend and associate of Srila Swami Maharaj and whom Srila Swami Maharaj had described as “My siksha-guru.” After establishing a deep, heart connection with Srila Sridhar Maharaj, he was given the sannyas title of Sripad Bhakti Pavan Janardan Maharaj. 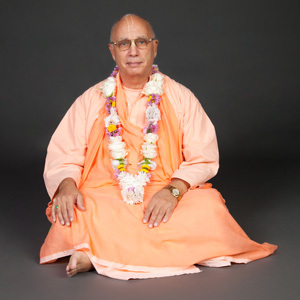 Shortly after this, he purchased the first “owned” Temple of the Sri Chaitanya Saraswat Math in Mexico and he also began to spend more time preaching and inspiring the devotees in the United States. It was around this time that due to a financial crisis, the former San Jose Temple was lost. So with great endeavor, and under the instruction and guidance of Srila Bhakti Sundar Govinda Dev-Goswami Maharaj, Srila Janardan Maharaj, together with Sripad Yudhamanyu Prabhu Seva Vikram, were able to reestablish the San Jose Temple and a short while later, with the order and backing of Srila Govinda Maharaj, were able to purchase the magnificent Sri Chaitanya Saraswat Seva Ashram, located in the hills of Santa Cruz, California. Finally, before leaving this world, Srila Govinda Maharaj declared in his Last Will and Testament “And in America Sripad Janardan Maharaj is a perfect personality. He is a perfect gentlemen. He will be Acharya. He is Acharya already but has given all the respect to me; I am giving in return to him. 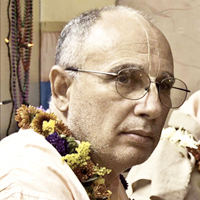 Sripad Janardan Maharaj will become the Acharya and Sevaite of the Soquel Math.” So, under Srila Govinda Maharaj’s instruction, Srila Janardan Maharaj has continued to care for and serve his divine mission.